I turned 31 last Thursday, so naturally I had to spend the following weekend with trains. Indeed, it was a very trainful weekend. On Saturday morning Jeff and I took the streetcar to the BART to Amtrak to Old Sacramento State Historic Park. Three different trains, folks! Old Sacramento is the older part of our state's capitol, near the river, with lots of buildings from the 19th century now filled with taffy shops and tattoo parlors and gift stores. It was loads of fun. Of course, the highlight of a trip to Old Sacramento is a visit to the California State Railroad Museum. I'm not a train fanatic, really, but I do love a good train, and the museum is chock full of them. Big, big trains. Inside the museum. It was fantastic. *gorgeous old locomotives from the 1870s, restored to their former glory. My favorite was painted a rich chocolate brown with yellow and red pinstriping and super shiny brass fittings. Unbelievable. When did people stop making utilitarian things so beautiful? Can we do this again? *a sleeper car from the 1930s. They had it on some kind of hydraulic thingie that made it pitch and sway while you walked through it. They blacked out the windows to heighten the "in another place" feeling, and had a sound system playing train noises. To top it all off, a very old gentleman who "only worked on the trains for 38 years" was sitting there in full conductor gear, ready to answer any questions one may have about the old days. *many, many 8 year old boys and 65 year old men. Apparently, these two groups are CRAZY for the trains. I was in good company. *I told one docent that my grandpa and his father (my great-grandpa) both worked on trains, but that I'd never really had a chance to speak with either of them about their experiences before they passed away. I was roundly chastised (in the kindest way possible) so I resolved then and there to get the complete scoop from my dad, who knows the whole story. I guess I'd never thought a whole lot about it, it was just one of those things I knew about my family - but now I want to know how, when, what they did, etc. That's what a good history museum does, it brings it alive, and makes you proud of your own family's past. So last year, longtime readers may remember, I spent my 30th birthday at a local cemetery. This year I spent my birthday with trains. Any thoughts as to what these choices may represent? If you're in the Sacramento area, do check out Old Sac and the Railroad Museum. A great way to spend a birthday. Photos of my trip are on flickr - after the Thanksgiving holiday I'll have photos of other recent stuff (new toys, great birthday presents, etc). Have a fun weekend, y'all! I remember standing at my nana's back fence waving to the people in the trains as they passed by.I remember the clickedy-clack,and the rattlesof the trains, the smells,along with the gentle swaying as a passenger too.Oh and to be 31 again...the things I wouldn't do! 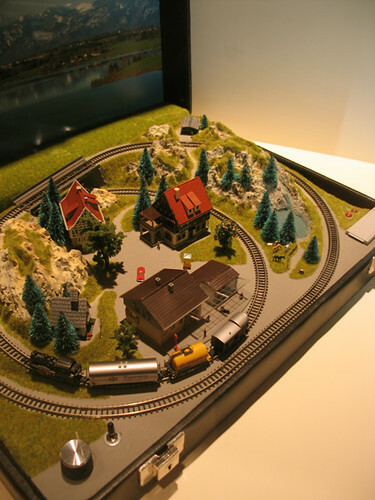 Is that wonderful little compact train world seriously IN A SUITCASE? I'm not sure why that makes me so darned happy. But I totally want a suitcase like that. Would you check it, or carry-on? I've been to Old Sacramento a few times but I've never been through the train museum. I"ll have to insist next time I'm there. it means you feel connected to the past! happy birthday! thought about you on thurs!!!!! oh, i've heard of this museum, but never been. i hope to go soon. sounds like a very fun bday. hope doc's clock was fun too. sorry i missed it. Yes, I agree that it means you're connecting to the past. Or that maybe 30 at the cemetary was death (the death of the 20s! ack!) and that 31 is a big adventure with trains. And family. And connecting with the past in a lively fun way with the people who aren't in cemetaries yet. Cancer ate my dad last year, and I'd give up anything I've done this year on any day to talk to him about trains. Take the inspiration and run with it! We just love Old Sac and the train museum! Old Sac is neat; I went through there last March. Can't figure out why so many places sell taffy there, though. One is a novelty, two is a little weird, but four is downright suspicious. Still, at one of those candy stores--the biggest one, whatever its name--they were giving out a lot of freebies, and not just taffy. I ate an honest-to-god chocolate-covered grasshopper. Mmm... insectalicious. I've done that exact same jaunt when my kid was in his Thomas the Train and Brio train phase. Several times ;-) Quite the fun day, and hope you got to check out the historic downtown (my favorite place is the guy who only does french fries (done up European style), but with a kajillion options for toppings. Another good place to see some fun train stuff is in Point Richmond. There is a group of folks that build model railroads but match everything *meticulously* and to scale to show former California train routes. It's amazing. It's basically then doing their hobbie thing, but then they opend the doors on the weekends and charge a few buck to help pay rent. And a day cruising the Point Richmond little shops is also a total treat. Trains aren't so bad. Beats my last birthday where I sat delayed on a plane for a good portion of my day. Given the choice of moving train and stationary plane, I'd spring for the choo choo!